When I'm out and about I am always looking for any kind of goodies for my cocktail recipes. 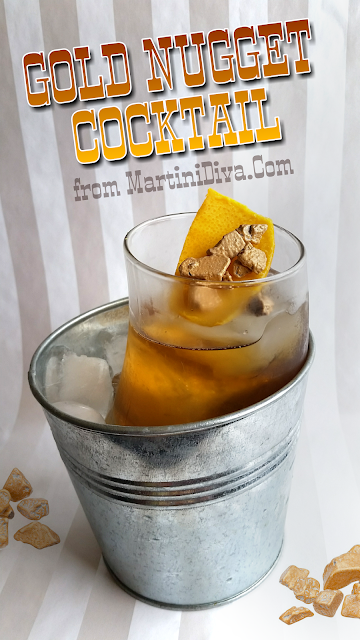 I love hunting for unique and vintage cocktail glasses as well as interesting barware and tools, but I'm especially on the lookout for fun new garnish ideas. When I recently stumbled on some chocolate gold nuggets my mind went immediately to the California Gold Rush. A whiskey based cocktail was definitely indicated so I snatched those nuggets up like an impoverished gold miner and headed back to my bar. 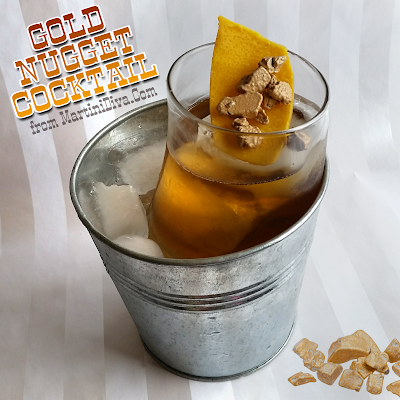 Typically gold prospectors drank their whiskey neat, but I'm all about the cocktail, not just a few fingers of hooch, so that called for a few additional ingredients. 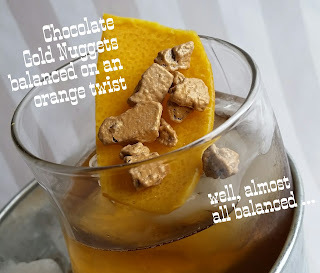 There is a Gold Rush Cocktail but it's basically a whiskey sour and I wanted to feature the chocolate in the nuggets so I replaced the lemon and simple syrup with a chocolate liqueur. To play up the bitter conditions and results of most prospectors efforts, and to balance the sweetness of the liqueur, I added a bitter amaro element with some Fernet and some cocktail bitters. DIRECTIONS Chill glass in freezer. Add the ingredients to an ice filled mixing glass and stir with a bar spoon for 30 seconds. 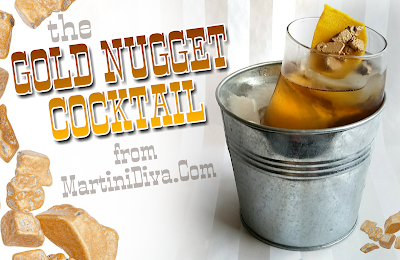 Strain over ice into the chilled glass, garnish and serve. Historical Gold Rush Saloons Tidbit: One of the interesting things that's always stuck with me about the California, Klondike and Colorado gold rushes were tales of the fortunes of gold dust under the floors of the saloons near the mother lodes. In the California gold rush, prior to the opening of the San Francisco Mint, placer prospectors often paid for their dime shot of whiskey with a pinch of gold dust from their poke sack. The barkeep would reach in the sack and take a pinch between thumb and forefinger, considered roughly the equivalent of ten cents. In this transfer (and through other means) tons of gold dust apparently sifted down and through the wooden floor boards of gold mine era bars and reports are that many an enterprising bartender or saloon owner mined more gold than many prospectors. There's even a reference to this in thevClint Eastwood movie musical Paint Your Wagon. For some reason most people, myself included (as you will see below), tend to bring carrots to use in the bar at Easter. It makes sense because carrots are a spring vegetable, but in our modern world they are available year-round, are very healthy and have a sweet earthiness that works well with many spirits. Carrots also come in a wide array of colors and pair well with a number of herbs and spices, making it a versatile and naturally beautiful colored juice for drinks. 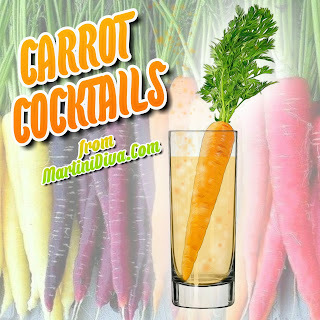 It's past time we should give the carrot a little more happy hour respect. 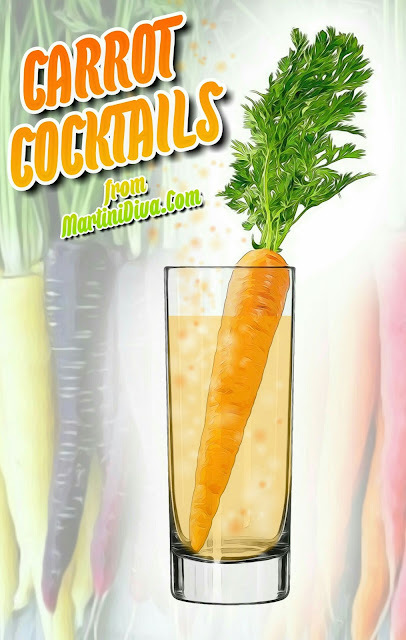 The most important thing to remember when making a carrot cocktail is to use fresh carrot juice, and to use that juice immediately as the flavors and nutritional value begin to break down almost immediately. After that the sky's the limit on creative carrot cocktail choices. International Carrot Day is April 4th, Carrot Cake Day is February 3rd.